As an urban working adult and a blogger sometimes I find it hard to juggle so many things at the same time. So I can't avoid stress, environmental factors, late nights, chemical treatments and not so healthy diet. All these factors can actually affect the delicate equilibrium of our hair, causing hair loss, itching and reddening of the scalp, dandruff and overactive sebaceous glands. Therefore recently I found out that my hair starts to thin, it scares me a lot because I think hair is very important for our overall image, it’s our crowning glory. If we don’t take care and take preventive action then when the problems become severe it might be too late. After browsing through the entire new Hairdepot Loft @ 1 Utama outlet, I found that there are so many hair products that I wanted. But I am not too sure are they suitable for my hair type or not plus do I really need all of them? I am glad that the hair consultant at Hairdepot approached me. After I explained to her my hair concerns she recommended me to a few hair and scalp care products which I really need. This is preventive and revitalizing shampoo for weak and hair loss problems. The shampoo is light purplish in transparent thick liquid. It is very mild and low suds with a mild floral scent. During washing my hair did not fall as much as it used to be because this shampoo is very gentle. Plus it helps to prevent hair fall and stimulates hair growth through its vitamin complex. 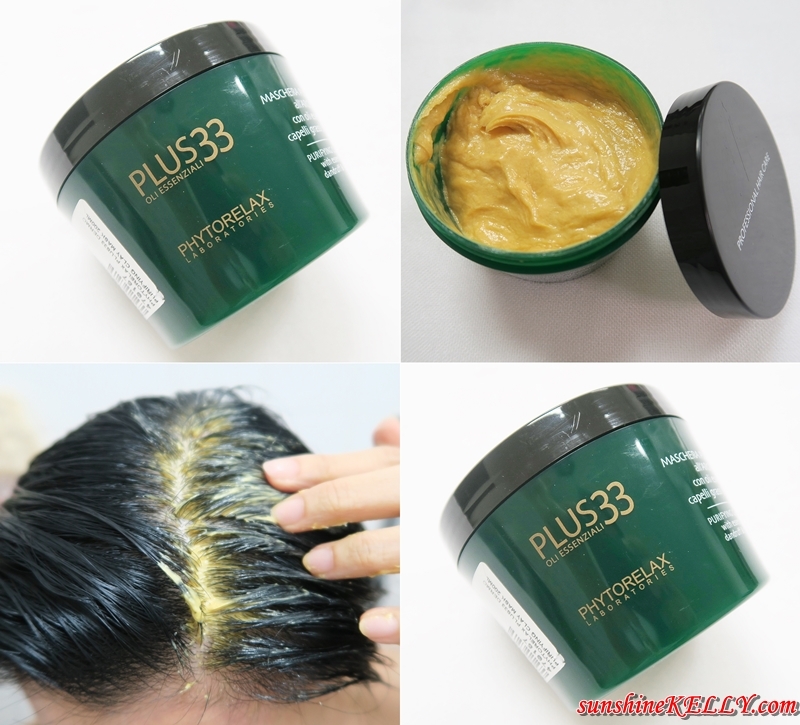 This hair mask is targeted for oily and sensitive scalp which can caused hair loss. The PLUS 33 treatment products are formulated using the principal benefits of 33 essential oils and medicinal plant extracts whose toning, cleansing, reinforcing and soothing properties rebalance the natural biological processes of the hair and scalp. It’s thick yellowish cream, looks like and smells like turmeric to me. Well turmeric is a very good natural source to treat hair fall as well. It does not contain SLES, parabens, silicones, mineral oils or colorants. After washing my hair, I apply this hair mask with clay, oils and medicinal plant extracts on my scalps and leave it for about 10 to 15 minutes. It helps to combat the causes of dandruff and oily hair, leaving the hair shiny and silky. I feel minty, it’s very refreshing and soothing especially on those itchy and dandruff scalp. After that I rinsed the mask off with water and then leave to dry naturally without using hairdryer. I can see that my scalp is cleansed, without any dandruff, no itchy, redness. I will continue to use it one a week to cleanse away the scalps impurities, this mask is like a scrub for my scalp. This is the hair loss intense care active lotion. It’s the shock treatment for the scalp, regulates and prevent hair loss at the same time improving hair density. It comes in 12 mini glass bottle and each bottle is 8ml. So after washing hair and mask, apply the Erayba Professional Line Z18r Zen Active Shock Lotion on to scalp, the massage a few minutes to help the lotion penetrate better. Leave in and do not rinse. Apply 3 times per week on alternate days after washing hair. This is a four weeks treatment. Usually I will use half a bottle each time. When apply on my scalp I feel a bit minty and the solution or clear liquid absorb very fast into my scalp leaving a light and fresh. Regular usage like 3 times a week can help to stimulates blood circulation on scalp, soothes the scalp and strengthens hair growth. 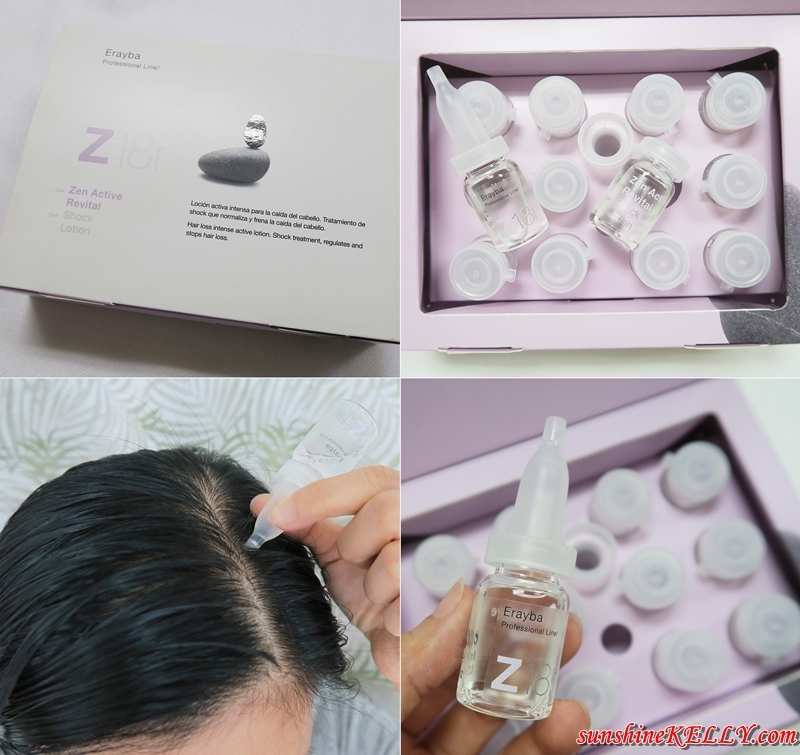 Its active components prevent the aging of hair follicle and hair loss. This is awesome to treat the dry. The argan oil hair serum smells so good on my hair. The argan oil naturally penetrates the hair to help moisturized each layer of the hair strand for long-term hair repair so our hair actually looks and feel healthier, silkier and extraordinarily shiny. It is very versatile specialty to be used on either wet hair or dry hair for an immediate straightening effect and long-lasting anti-frizz protection. Creates a thin film which protects the hair from the aggressions of brushing and hairdryer heat and the frizzing effects of external agents. Makes hair easier to style and leaves it soft, silky and shiny. This is awesome! Now you can redeem a bottle of Hairdepot Argan Oil Hair Serum that worth RM89 for FREE with no purchase required. Hurry oh! only for the first 100 people valid until 15th July 2016. These are the simple steps to redeem it. 4. Show your repost / regram photo on your Instagram to the staff at @hairdepot_my new store at One Utama, Lower Ground, LG311G, New Wing. Why We Shop at Hairdepot Loft? Well I feel that it is more convenient and easier to shop at a professional hair care one stop center that cater for our hair and scalp care needs. Hairdepot Loft is one of Malaysia leading retail chains that hair care, scalp care, hair styling, hair tools, skin care, body care and they even have baby products too. However, they focus mainly on hair care and scalp care plus hair styling. It’s a one stop centre because there are 13 house brands sold in Hairdepot Loft such as Midori, Hair Milk, Herbalogist, Hairdepot, Greenology, Ecru Little Green, Ecru NewYorkStreets, Cab’s, Aurane, Erayba,Phytorelax, Farcom Mea Natura, Farcom B-Style, Farcom Aler and many more. 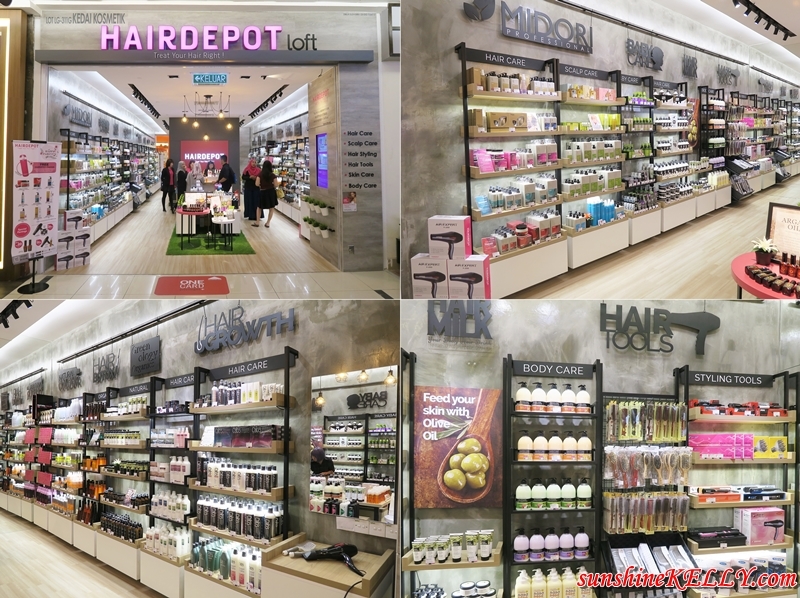 As of now, Hairdepot Loft has 29 outlets operating in Klang Valley and Johor under the brand HAIRDEPOT and K CARE SHOP. All their products can be purchased from HAIRDEPOT, HAIRDEPOT Loft and K CARE SHOP as well as online www.kcareshop.com. Having a dedicated shop for hair care looks fine idea. Am sure there will be products available for all here. such a good help. may try out their product soon! need to save my hair before going bald.